I recently spent a beautiful week at Great Hucklow, attending and participating in the annual summer school. The subject this year was “How then shall we live?” We were exploring how we live with the fact that we will inevitably die; we were looking at grief, love, loss and legacy. The legacies of those who have touched our lives and are now gone as well as what might be our legacy when our time comes, perhaps the ultimate question. It was said that the panel had been brave in choosing the subject. I agree with this sentiment, it was very brave indeed. Forrest Church said that “Religion is our human response to being alive and having to die.” Surely the ultimate question for all of us. That said I would add a little more, the theme of the week, knowing this…then how shall we live? Now the week did not go exactly as planned. We were given a big dose of the ups and downs of life. The troubles started before I’d even set off. I was to be co-facilitating a group exploring grief and our legacies of love and loss. I had spent some time with the co-facilitator preparing the group we would lead throughout the week. On the morning I was setting off I received a message telling me he was unwell and would not be travelling that day. I received news the next day informing me he would not be coming at all. So I had to quickly make adjustments and do things alone. People were very supportive and the group was a truly moving experience. More beautiful than I could ever have dreamed possible; a beautifully deep and engaging experience that I was blessed with leading and experiencing. Thank you. Now this was not the end of the challenging experiences. Early in the week trouble began to strike. First all the water went off in the whole village. As this occurred people began to be struck down with what we used to call sickness and diarrhoea but is now called the norovirus. Each day three or four would go down with it and would have to quarantined for 48 hours as all kinds of measures were put in place. The quarantine room became known as the leper colony as they were fed and socialised together until they were deemed fit enough to join the rest of us as they were no longer infectious. 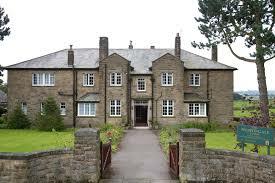 Great Hucklow is only three miles from Eyam, something that was not lost on any of us. 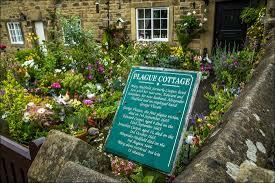 Now for those who don’t know Eyam is known as the “plague village”. It was the village that basically quarantined itself during the plague of the seventeenth century. It cut itself off from all the surrounding villages so as not the spread the plague that had arrived on cloth from London. Of the 350 village inhabitants only 83 survived. Incredibly one of the survivors was the grave digger. 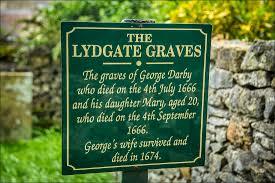 Sue and I decided to pay Eyam a visit one afternoon. As we drove towards it there were signs saying the village was cut off, due to roadworks, it gave us a deeply earie feeling. A local told us to ignore the signs and to just drive through, which we did. We walked around for a couple of hours and took in the sights and sounds, visiting the church yard and reading the history of the place which was sign posted everywhere. I was particularly moved by the list of dead outside each little cottage, I felt the pain and grief that they must have experienced as one after one family members died. Whole families were wiped or just one or two survived. I also noticed that commemorative service which was to be held in open at near by at Cucklet Delph. The church services were held in the open air at the time of the plague to stop the spreading of infection. As we left Eyam and returned to Hucklow I thought how incredibly faithful these people must have been and how willing they were to sacrifice for a greater good. A wonderful and beautiful example to us all as to how we might want to live. The village is a beautiful example to humanity of how we can be at our best. By isolating themselves they protected others, by not infecting others with the illness they had passed on something beautiful, a legacy of love and self-sacrifice, an example that still lives on today many centuries later. Just a beautiful counter to the selfish and self-centred ways in which so many of us live today. Now this sounds like the kind of infectious disease that ought to be passed on; the kind I would love to see grow and pass on throughout the whole world. A kind of blessing to humanity that could spread through us all. It used to be thought that this is about the Great Plague, although folklore scholars do dispute this, some suggest that its origins maybe the spreading of disease amongst the early American settlers in New England. Who knows, certainly not I. The reason it came to mind is the A-tishoo! As I’m one of life’s great sneezers. Oddly one of the things that Sue first noticed about me was my unapologetic sneeze. Now whenever anyone sneezes don’t we all say “bless you”, we wish one another well for the sneeze may be a sign of impending illness. We pass on a simple blessing, gosh don’t we all need more blessings. During the 1950’s the phrase “Pay it Forward” was popularised by Robert A Heinlein, initially by being referenced in his book “Between Planets.” Heinlein preached and practised this principle in his daily life and this led to the formation of the Heinlein society, a humanitarian organisation based on this principle. 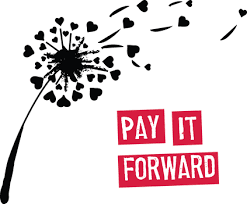 In the year 2000 Catherine Ryan Hyde published the novel “Pay it Forward” which became a best seller and was soon made into a film by the same title. This led in time to the formation of the “Pay if Forward Foundation.” It even has its own day. 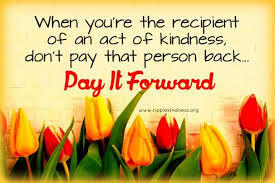 Did you know that April 26th is “International Pay It Forward Day”. This is a day when millions of people intentionally commit to acts of kindness and caring. Pay it forward is based on what is known today as the “ripple effect”, which is really based on Confucius concept of “Concentric Circles of Compassion”. Like a pebble dropped into a pond, our actions create ripples that go out and affect others beyond what we can imagine. It works on the premise that we can make our world a better place if we share, if we care as much for others as we do for ourselves. It is firmly grounded in the ethos of the “Golden Rule of Compassions” a concept found at the core of every single one of the world’s great religious traditions. It is an effort to change the world one small act at a time. Everything we do and everything we do not do really does matter. We affect our world, for good or for ill, with every feeling, every thought, word and or deed. 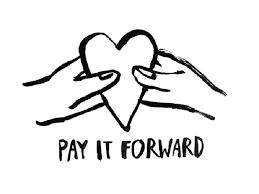 One of the great movements for social good of the twentieth century is enshrined in the concept of “paying it forward”. Alcoholics Anonymous and the near two hundred other fellowships that have sprung from its principles have brought about recovery for millions of people from all manners of addiction. When a person is released from their destructive addiction they are not asked to pay back what was freely given to them, instead they are asked to pass on what has been given to others in desperate need and when doing so to also pass on that they do not have to pay back what has been given to them, instead they too must pass it forward. This is the basis of the simple movement that has saved millions of lives. When I look back at my life it blows my mind to think of all the good that people have done for me. During the group, I had the privilege of leading at Hucklow, we spent time remembering the gifts that had been given to us the blessings of the lives that had touched and inspired ours, that deep love that had turned to grief when those lives ended. As we considered how we should now live, the conclusion that we came too is that surely what we need to do is to make of these lives acts of remembrance by passing on these beautiful examples to others, in the hope that they would be caught up in the love and pass it on also. This is the kind of infection that does not want to be quarantined, this is the kind of blessing that the whole world needs and is a true antidote to the disease of selfishness and cynicism that seems to be taking hold in humanity these days. To bless the world all we have to do is remember those wonderful examples that have touched our lives and blessed us with their loving example. No we cannot pay back to them what they so freely gave to us, but then we don’t have to, all we have to do is pay it forward and become the blessing that we have all been waiting for. It is easy to look at our world and despair and give up and say “what’s the point? Everyone is out for themselves. If I go out of my way to help another, they’ll just keep on taking advantage and what will I ever get back in return? 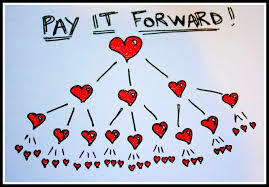 There is though another way; this other way is the purpose of the “Pay it Forward” movement. 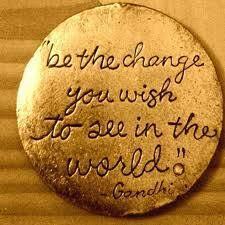 We can change our world, one act at a time. This is religion in its deepest and simplest form, binding up the broken manifesting God’s love in life. At its core is this life affirming principle that in spite of a great deal of evidence to the contrary faith, hope and love do in fact still remain. You see these ripples touch everybody both the giver and receiver and all who are eventually touched by them; both the giver and receiver are transformed by the experience; both giver and receiver are blessed abundantly. So let’s become the blessings we have all been searching for; let’s remember all those times in our lives when someone has gone out of their way to help us with no expectation of anything in return; whether they have helped us materially, intellectually, emotionally, or spirituality; let’s re-feel these occasions and to meditate on them and to come up with ways that we can pay these debts forward; let’s think of ways we can give back to our world; let’s create ripple effects that can impact in our shared world in ways we perhaps can’t even begin to dream of. Love this post! It helps explain your comments in response to my article on gratitude. Thanks Danny.